We're super excited about what we've come up with for our holiday special this year. We wanted to offer something different for the holidays, not just the old tiny flat-rate discount or free shipping. Those just seem so impersonal and really, not very interesting. But there's not much wiggle room for big discounts in a micro-business like our's. So we took a look at our retail items, and picked six of our most popular items, pieces that we also love, to offer at a deeper discount. Starting today and running through December 31, we're offering a 25% discount on a wide range of items, from $20 to $900, across all categories of our work in metal, mosaic, & wood. If you have been craving one of our pieces, now just might be the time to treat yourself. 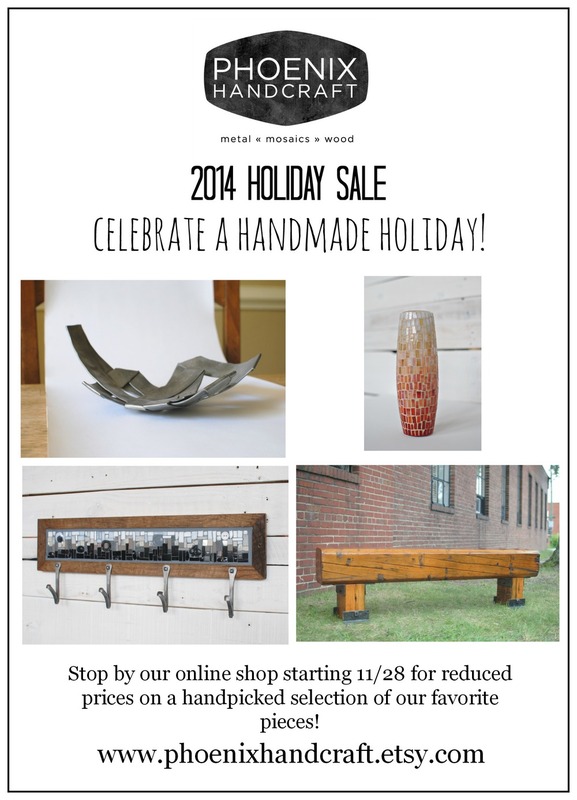 Celebrate a handmade holiday!